Classic crocheted mittens in a range of children’s and women’s sizes are so easy to make, you’ll want to make a pair for all the kids and ladies in your family. Starting at top of mitten. ch4, join with a sl st to form ring. Rd 1: Work [5-6-6-7] sc in ring, join with a sl st to 1st sc. Note: mark beg of each round for ease in counting rds. Rd 2: 2 sc in each sc. [10-12-12-14] sc join with sl st.
For sizes 5-6 and 10-12 only work the following rd: 2 sc in next sc, sc in each of next [9-11] sts, 2 sc in next sc, sc in each st around: [22-26]; do not join. For all sizes: continue working even in sc without joining at ends of rnd, until piece measures [3 1/2-4 1/2-5-5 1/2]” from beginning. Ch [3-4-5-6] skip next [3-4-5-6] sts, sc in each st until you reach the chain, sc in each ch. Continue to work even in sc until piece measures [1 1/2-2-2 1/2-3]” from chain. Do not cut yarn. 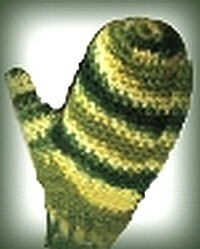 The cuff is worked at right angles to the rest of the mitten. Chain [10-12-14-16] stitches starting with the stitch you have left on the hook. Row 2: Skip 2 sc sts just worked; working in back lp only (the loop away from you) of each st, sc in each sc of Row 1; ch 1 turn. Rep Row 2 and 3 around the entire wrist. Do not cut yarn. Turn mitten inside out, loosely join last row of ribbing to first row of ribbing with sl st. Finish off yarn. Turn mitten right side out, hold piece with cuff at bottom. Join yarn at right of thumb opening with a sc. SC in each st across to left side of opening; sc in each st to right corner, sc in corner: [8-10-12-14] sts; join with a sl st. Work even in sc [(do not join rnds) for [1/2-1/2-3/4-1]” On next rnd, dec 2 sts. Work even in sc until thumb measures [1 1/2-2- 2 1/2- 3]”. Cut yarn leaving a 10″ tail. Use needle to wave through each st at top, pull tightly, fasten off. Weave in ends.